One day, about two million years ago, a caveman discovered that lying with a cavewoman could lead to cavelings, while lying with other cavemen never did. This was a Discovery! He began to speak to other cavemen about his discovery. 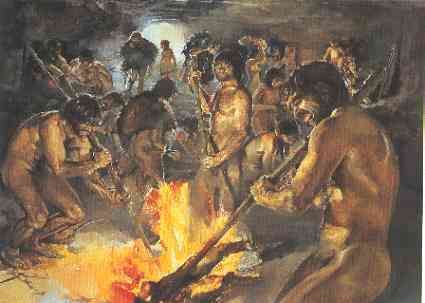 He began to extol the virtues of making as many cavelings as possible with as many cave women as could be found. And he also began to warn everyone against lying with their fellow cavemen. He told them it was Wrong. He told them it was Unnatural. He said it would affect their ability to hunt mammoths and make fire. Unnatural Cavemen | B92 Blog.